Toronto – Odon Wagner Contemporary is pleased to announce the opening of Green Line, Blue Line, an exhibition of works by Yehouda Chaki on May 11, 2006 (reception: 6-9pm). The exhibition features twenty-six new landscapes on canvas, wood and paper. Chaki's exuberant landscapes and still life paintings are widely collected by individuals, corporations and museums alike. It is interesting to note that The Giller Prize presents recipients with a specially commissioned one of a kind bronze statue, sculpted Yehouda Chaki. 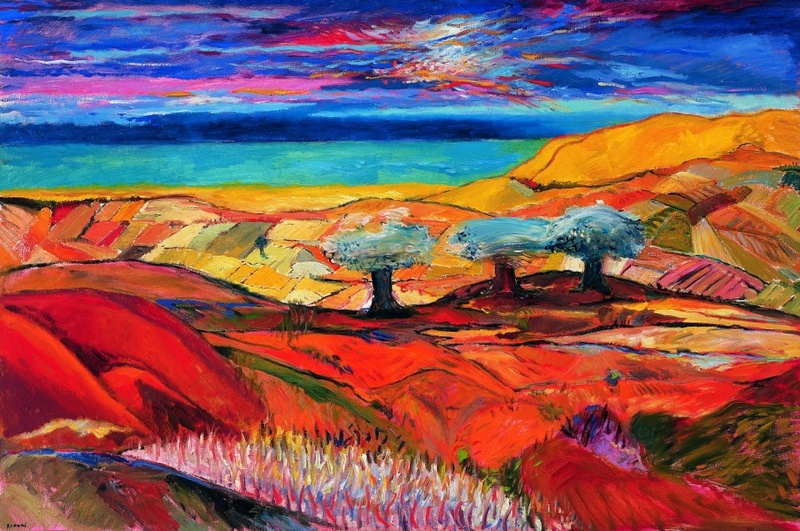 He is perhaps best known for his panoramic landscapes of the Golan Heights in Israel. These sweeping panoramas are painted in warm hues of orange and red with bold expressionistic brushstrokes. In the late 1950s when the area was still part of Syria, Chaki served in the Israeli army, where he was required to make topographical sketches of the Golan. The landscapes he paints today are not made perceptually; He chooses to rely on his memories and imagination to evoke a reconfiguration of places that are imbued with emotion, and a collective sense of history.